If you are looking for the best deals on carpet installation in Franklin, you have come to the right place. 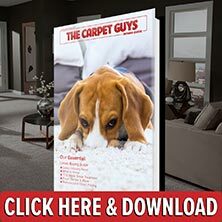 With The Carpet Guys at your side, buying new carpet is easier than ever. We want everyone to have the ability to enjoy new carpeting, so we try to accommodate with almost any budget. Whatever type of carpeting you desire, we have what it takes to install it for you. Get the best carpet installation services from The Carpet Guys. When our installers arrive at your home, they can pull the furniture out of the room(s) for you upon your request. After the areas receiving new carpeting have been cleared of all the furniture, the old flooring can then be ripped up, neatly bundled, and placed outside by the curb (if applicable). After all of the old flooring has been removed, new carpet padding can be rolled out and the carpeting is placed on top and installed. The remnants of the new carpeting are taken out and the furniture is put back into the original layout it started in. Whatever carpeting needs you may have, we have the means to handle them. Take a couple seconds to get a free in-home estimate scheduled and get started on renovating your home today. We look forward to hearing from you in the near future.